Book itineraries using database, XML and one-offs in TravelHerd. We have combined these various booking methods in one place, per type of service, for ease of booking into your TravelHerd scratchpad for quotes or into your existing TravelHerd proposals and reservations. Popular, frequently booked accommodations and services which have been previously stored in your TravelHerd database can be booked into your TravelHerd scratchpad or proposals and reservation from XML interfaces or database items in one single pull down; XML items are flagged. TravelHerd will retrieve current rate information based on the interface mode and supplier. For services which have not been previously-stored in your TravelHerd database, TravelHerd provides links to wider search XML scripts by supplier to find them. When the rates and services are displayed, there is a link to display and store the product details in TravelHerd for current and future use by you and other TravelHerd users at your company. 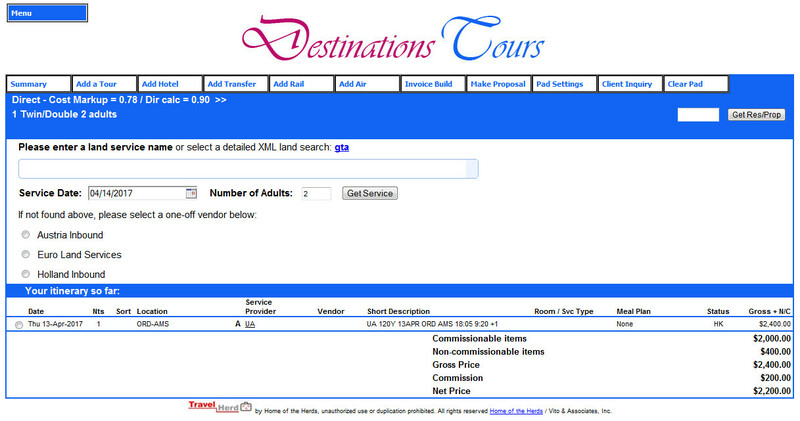 Accommodations and services booked through an XML interface which have date sensitive information, e.g. seasonal hours of operation, etc., are automatically updated in the TravelHerd database via the XML interface every time an inquiry for these items. To book non-XML interface or non-database services in TravelHerd, a form screen with fill-in items is provided. TravelHerd can then email the request to the supplier; alternatively, net rates can be entered in the TravelHerd database as well, if booked through suppliers with non-interactive third party systems. Team TravelHerd put our programming skills to work and utilized valuable client input, based on their experiences constructing custom FITs, into building a robust FIT booking engine which recognizes the various ways components are incorporated into itineraries. With system flexibility and intuitive, user-friendly design, your reservation agents will be able to book itineraries using database, XML and one-offs in TravelHerd with surety and ease.